Home » PFAFF » PFAFF creative icon » Stop unthreading your machine to make new bobbins! Can I mention one quick feature that I really love on the PFAFF creative icon? How about NOT having to unthread your machine to make a new bobbin? Believe it or not, we can wind a new bobbin directly through the needle without having to unthread/re-thread the machine! The people at PFAFF have added a groove on the front right side of the machine which means that we simply must bring the thread through that area and up in the bobbin. OK… please read the instructions in the manual as there are more steps and remember, the manual is your best friend! It did take me a few times to figure it out, but it was well worth it. Now let’s continue our project, shall we? If you’ve been following me since Monday then you’re ready for Step 6, if not simply go back to see all the fabric requirements for this table topper that will banish the February blues. 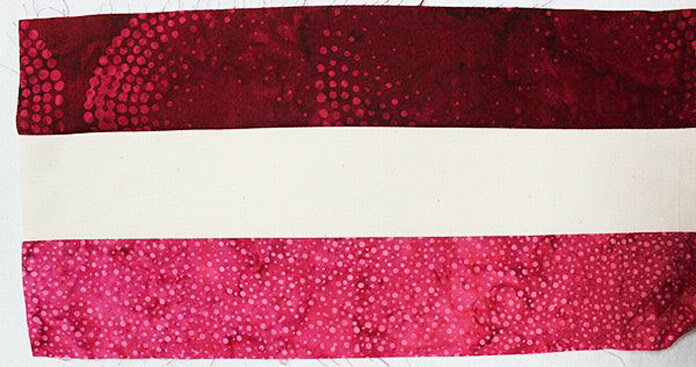 Stitch a background strip to the medium dark B2 strip. Cut to make four 2½” x 4½” rectangles. Set the rest of the strip aside for Step 8. Take a background fabric strip and cut four 2½” x 6½” rectangles. Stitch a rectangle to the end of the medium dark fabric square of a Step 6 rectangle. Makes four 2½” x 10½” rectangles. Stitch your dark A2 strip to the background edge of your leftover strip from Step 6. Cut to make four 2½” x 6½” rectangles. 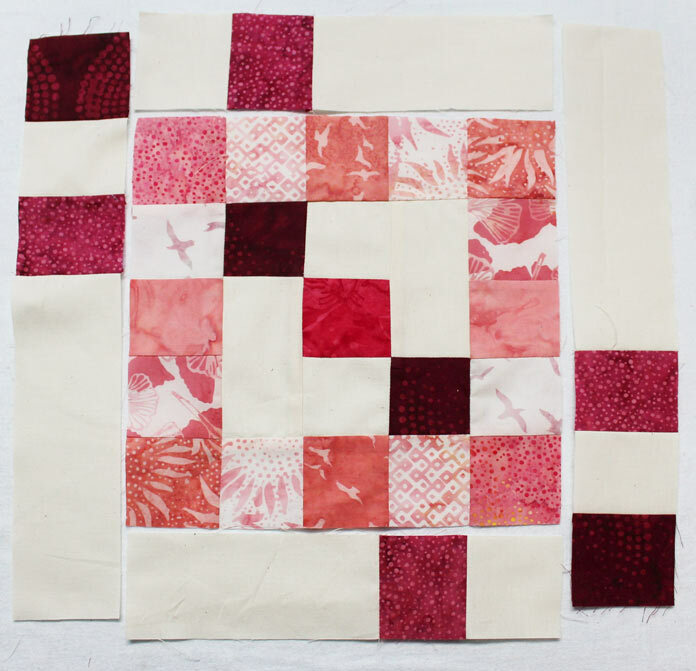 Take a strip of the background fabric and cut four 2½” x 8½” rectangles. Stitch a rectangle to the end of the medium dark fabric square of a Step 8 rectangle. Makes four 2½” x 14½” rectangles. Stitch two Step 7 rectangles to the center block, on opposite ends. Make sure that the medium dark square is aligned with the dark square in the center block. Stitch two Step 9 rectangles to the center block, on opposite ends. Make sure that the medium dark and dark squares are aligned with the dark square in the center block. Makes one 14½” square center block. Stitch one Step 7 rectangle to one side of the end blocks (where the dark square is in the block). 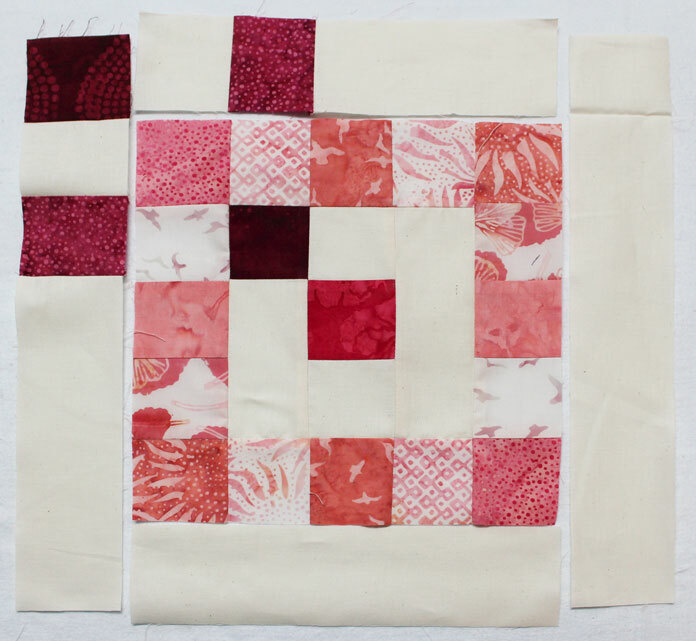 Cut two 2½” x 10½” rectangles from your background fabric. Stitch one background rectangle to the other side on the end blocks. Stitch one Step 9 rectangle to the end blocks (where the dark square is in the block). 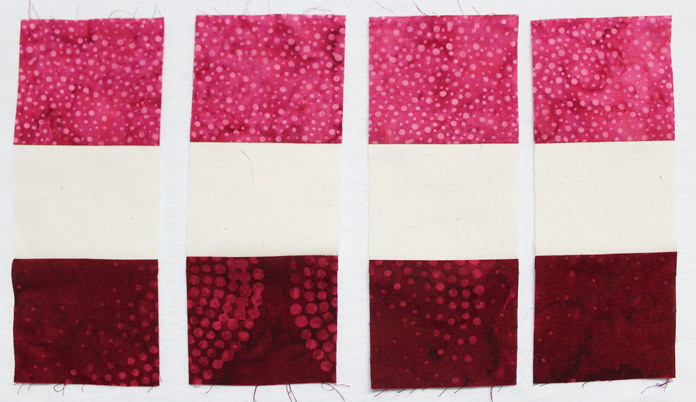 Cut two 2½” x 14½” rectangles from your background fabric. Makes two 14½” square block. Congratulations, the second part of the table runner is ready. Now tell me? How many times have you had to unthread your machine to make a new bobbin during this project? Wouldn’t you love this feature on your machine? Follow along tomorrow to continue this fine project as we discover more stellar features on the new PFAFF creative icon.